I have a lot of recipes still to try! I would type a bucket list, but that would distract me from what matters, which is being in my kitchen. We had visitors over for dinner, and I made an apple and gooseberry tart tatin. The apples I bought were not crunchy and therefore not suitable for eating and as I was making roast pork I should have made some apple sauce or caramelized apples to go with it. However, I chose to spend the day watching the Olympics and so the following weekend I used up some of the apples for an apple crumble. This recipe is all about the crumble and I froze half of it to use the next time I felt like a hot dessert. That did not take long as I have some lovely frozen berries from our local berry orchard. I went there to buy fresh gooseberries, and the frozen ones were much cheaper. As the berries are all freshly frozen it was worth my while to stock up. The crumble topping was taken out of the freezer and left to thaw while I prepared dinner and the dessert, and I must say that it was perfect! Do you have a bucket list of recipes still to try? 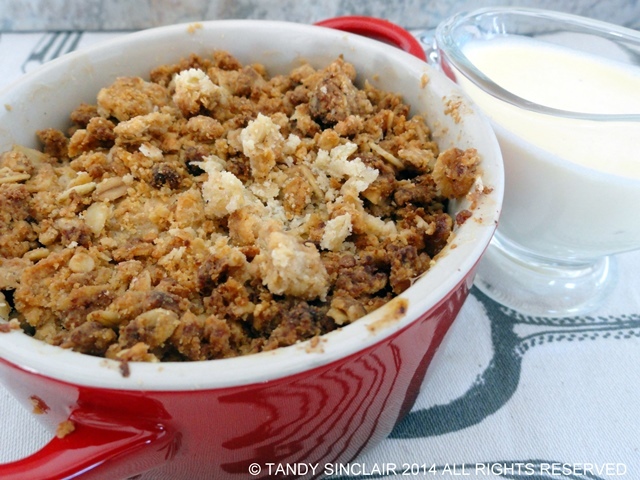 You can never go wrong with apple crumble. Delicious! Oh my gosh, I have list after list of things to make! It’s a little out of control, I need to get cooking! I like the idea of apple + pistachio, unique combo I wouldn’t have thought of! My bucket list is MILES long. I love a good apple crumble! What a delicious recipe. The addition of pistachios sounds extra crunchy and yummy. Like the idea of adding pistachios to the crumble. Some varieties of apples in my orchard are almost ready to start picking. Then it will be “an apple a day”. 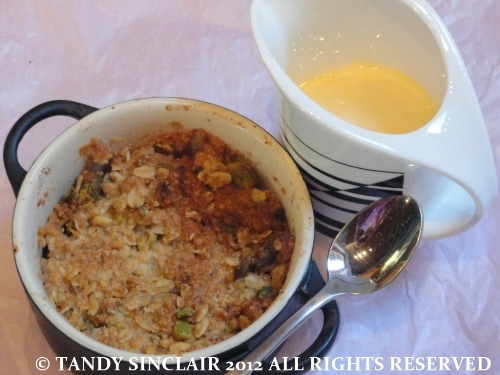 A delightful crumble which i so much love! I love that you made custard too! 🙂 Yummy Yum! You know I don’t think I have ever made a crumble which is shameful coming from a British foodie. Bizarrely the best crumble I have ever eaten was in the middle of the Namibian desert earlier this year. I thought then that I must make crumble and never did. I really must buy some apples and make some this weekend. Lovely crumble – Pete would love the pistachios, they are his favourite nut.